Today was the first of my New Catalog Open Houses and it went GREAT! At least from my perspective, I hope all felt that way! Special thanks again to my club stampers who came to help-I can't thank them enough!! It was great to see all the stampers. Some, I hadn't seen for awhile, and some I just met today! Hope to see you all again very soon! Special thanks too to all who commented on the general good look of our place. I've spent lots of hours lately weeding, watering and generally keeping things up and it's all worth it when people tell you it looks nice. THANK YOU! Especially after a week of flying solo and being very tired of it all! OK, on to the stamping! Here is one of the cards we made today. I love the colors used here! I was inspired by a page of samples in the catalog that used the new Melon Mambo with Black and White and knew it would be perfect for the new Butterfly Punch and coordinating set-Flight of the Butterfly. 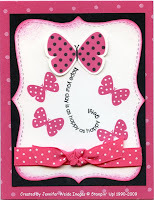 Card base is Melon Mambo, stamped in Craft White with the Polka Dot background. The Top Note was cut from Whisper White & backed with a Basic Black layer. The butterfly is a two-stamped image with two layers. You will want your Stamp-a-ma-jig to get them lined up correctly! Because the punch doesn't allow for the head or body, we stamped this butterfly twice. Once on the Top Note, near the top and once on an extra piece of Whisper White. Melon Mambo for the body, Dots/body in Basic Black. On the Top Note piece, stamp the swirl verse & smaller butterflies. Punch the extra butterfly & fold the image in half. Attach it over the direct stamped butterfly with a small glue dot, lining up the body. Bend or curl the wings just slightly for extra effect. Sponge the edges with Melon Mambo, add your Dotted Melon Mambo grosgrain, and layer together. All done! Hope the second open house went as well as the first! Thanks SO much for allowing us into your absolutely gorgeous home! Absolutely LOVED all the cards, and am really looking forward to actually USING some of the techniques that I learned on Sat!